Stand out in a crowd with the Arena Carbon Pro Mark 2 USA Camo. Camouflage has become a popular option for many individuals. However, you won’t always find it in the traditional natural colors most people think of, such as blacks, browns, greens and whites. Arena has decided to offer its Carbon Pro Mark 2 competitive swimwear in a limited edition USA Camo color that features America’s colors: red, white and blue. While camouflage is more typically worn by men during the hunting season, it has actually become a popular option for both men and women in daily life. This is why Arena chose to offer their Carbon Pro Mark 2 for both men and women in the red, white and blue camo. The Open Back Kneeskin for women provides the optimal coverage female swimmers need to perform her best in the water. For men, the Jammer style is the perfect option for optimal compression and the right shape in the water. Some swimmers love to be able to stand out from the other swimmers while they are in the water. Camo is one of the best ways to stand out from the crowd. When that camouflage is made from America’s colors of red, white and blue, everyone will want to know where you got the suit. Because this is only available for a limited time, the odds of encountering someone else who is wearing the same suit will be quite small. The Arena Carbon Pro Mark 2 is one of the fastest suits available on the market today. While competitive swimwear can’t help individuals improve on their technique, it can provide them with the advantages they need to swim even faster. This includes the right compression, proper coverage and a comfortable fit that provides free range of motion. When you add in the great color options, such as the USA Camo color, you have a swim team suit that can’t be beat. If you are looking for a way to stand out in the water or want to show your patriotic spirit, the USA camo color that is available for a limited time is a great option. The Arena Carbon Pro Mark 2 is one of the best suits on the market to help swimmers improve their times and swim even better. With this new option, you can find a way to improve your speed, show your team spirit and appreciate where you came from. Anyone who is interested in purchasing this limited edition suit should contact us immediately to place an order. The new Arena Carbon Pro Mark 2 offers maximum compression and support. The Arena Carbon Pro swimsuit has now lost its FINA approval, which leaves swimmers looking for a new competitive swimsuit. To compensate for the recall of this popular swimwear, Arena now makes the Carbon Pro Mark 2. This revolutionary swimwear uses the same carbon fiber technology as its predecessor in a way that is FINA-approved for competitive swimming on all levels. When it comes to competitive swimwear, it is essential to have proper compression to ensure you are more aerodynamic in the water. Both males and females have trouble spots that need maximum compression for greater performance in the water. The Arena Carbon Pro Mark 2 competitive swimwear offers compression in the exact locations swimmers need to help them move through the water seamlessly at faster speeds. In addition to offering the appropriate compression, this competitive swimwear also offers support where swimmers need it most for optimal comfort. The Arena Carbon Pro Mark 2 is an incredible option for both men and women. The men can enjoy this suit in the popular jammer design that covers the upper legs and provides the appropriate compression and support where men need it the most. For women, Arena has constructed the Carbon Pro Mark 2 in the popular open back kneeskin design. This design offers the coverage women desire, combined with the same compression and support that is found in the men’s version. Both versions are the perfect option for those who are looking for a suit that supports optimal performance. When the Arena Carbon Pro Mark 2 was first introduced, it was only available in charcoal gray. Today, this swimwear is available in three colors so swimmers can choose the color they prefer. In addition to the charcoal gray, swimmers may also choose orange or cyan for their suit. These colors offer an incredible look for any swimmer. Whether you already own one of the older Arena Carbon Pro suits or you are in the market for a new competitive swimsuit, the new Arena Carbon Pro Mark 2 is a great option for all swimmers. This suit utilizes the latest carbon technology to create the proper fit and compression swimmers need to do their best in the water. Arena is excited to launch this newest suit to add to its collection of competitive swimwear and accessories to help swimmers make the most of their time in the water. The wait is over! The “White Hot” Arena Carbon Pro racing swimsuits are now available for purchase. This is the same suit that was worn in the 2012 London Olympics by top athletes like Rebecca Soni. The white and red Arena Carbon Pro Kneeskin and Jammers are unlike any other technical racing swimsuit on the market. Be one of the super exclusive to own your very own super fast Arena White Hot Carbon Pro Open Back Kneeskin racing swimsuit. The “white hot” colorway was specifically designed for the Arena swimmers in London. This suit is a white base color with gray carbon yarn weaved into the base fabric and features shiny red flames. The flames are above the main muscle groups emphasizing the muscular power of the athlete and the internal construction of the suit. The Powerskin Carbon-Pro is Arena’s revolutionary new racing swimsuit, the first of its kind to incorporate carbon fiber into the weave of the swimsuit fabric. Launched in February 2012, Powerskin Carbon-Pro is the product of a collaborative effort between Arena and its scientific network. What’s Your Favorite Carbon Pro Color? The Arena Carbon Pro comes in a variety of great colors. If you’ve ever paid attention to the swimsuits you will see at the pool during your workouts, training and competitions, you have probably noticed the dull colors everyone is wearing. A lot of people are wearing plain black suits because this is what a performance suit is made from, right? However, when it comes to the Arena Carbon Pro, you can experience the performance enhancement you desire with a splash of color that will make you stand out from the crowd. Available in the open back kneeskin, closed back kneeskin and jammer, you have four colors to choose from. If you prefer a more muted color that doesn’t stand out too much, the dark grey is the perfect option for you. This color is dark enough to almost qualify as black, allowing you to take advantage of the benefits of the Arena Carbon Pro performance suits without being too loud. Some people just want to stand out based on performance, not the color of their suit. Green is a sign of life and vitality. Bring new meaning to the color green when you purchase your Carbon Pro suit in this bright color. All your competitors will be green with envy when they see you streak by them in the pool, wearing this impressive green color. Everyone will be able to see you coming through the water. So maybe green isn’t your color. In that case, if you are looking for something bright to help you stand out from your competitors, bright red can be a great option. Your competitors and the fans won’t be able to help but notice this fantastic color as you streak through the pool. If you are looking for something that will stand apart from the typical mute colors swimmers wear for their performance suits but you want something a little tamer, the royal blue is an excellent choice. A darker color than some of the other options, you can show off what you can do with a little splash of blue to complement the blue of the pool water. So which Arena Carbon Pro color is your favorite? Will you choose the typical dark grey for your suit, or will you choose something a little different to help your performance stand out from the crowd, such as bright green, bright red or royal blue. Nothing but the best racing swimsuits is good enough for the Olympic swim teams. After all, the results of the Olympics depend on the swimmers’ speed, which directly correlates to the suit that is worn. A variety of innovative swimsuits that are light and increase speed, as well as flexibility, are what the Olympic stars of the 2012 Olympics desire. Precise fit and muscle compression is what competitive swimmers need. This can be found in the innovative Arena Powerskin Carbon Pro swimsuit line. The compression swimmers require is precise. Too much compression can restrict their movement, while not enough can slow them down. The Arena Carbon Pro line introduces an innovative way to find the delicate balance between too much and too little compression. 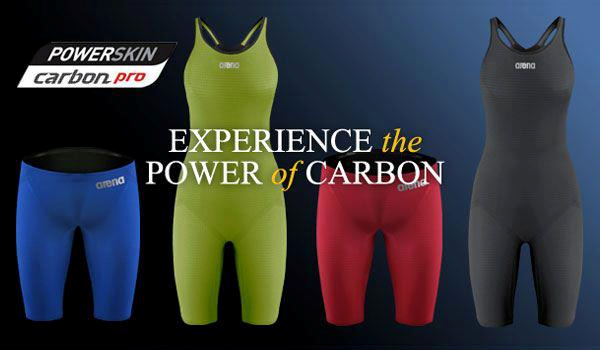 The Carbon Pro Kneeskin offers female swimmers maximum flexibility along with the perfect amount of compression. At no point will swimmers feel restricted or uncomfortable. They will be able to perform stronger kicks and perfect turns with incredible speed. 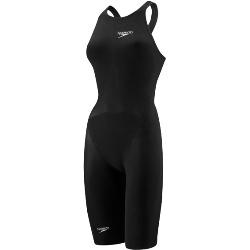 The Speedo LZR Elite Recordbreaker Kneeskin is just one of many competitive swimsuits. The innovative bonded seams of the Speedo LZR Elite Kneeskin offer more speed, less friction and less drag over sewn seams. Improving friction by as much as six percent, this makes a significant difference in a swimmer’s performance. The LZR Pulse fabric is not only water resistant but also delivers the right amount of compression to speed swimmers without restricting their movement. The Recordbreaker back offers the trendiest styling for competitive swimmers, making it one of the most popular suits among Olympic swimmers. It is also compliant with FINA regulations and offers flattering style for all body shapes. Watch your competitors start their race in fear when they notice the Speedo Fastskin swimsuit you are wearing. Known for its ultimate performance and ability to change the body’s shape up to 8.1 percent to minimize drag and increase speed, the Speedo Fastskin 3 is a suit that leaves the competition in the dust. Some of the amazing benefits you will realize from the Speedo Fastskin suit are incredible compression abilities to work with any body shape, bonded seams to increase speed and reduce friction and Fit Point Markers to ensure you are wearing the suit in the exact position it was meant for. All these factors combine to give you one of the most competitive racing swimsuits on the market. The Arena Carbon Pro racing swimsuits have been released and for a limited time you can get a free Arena Cobra racing swim goggle when you purchase one of the following Carbon Pro swimsuits: Arena Carbon Pro Jammer, Arena Carbon Pro Open Back Kneeskin or the Arena Carbon Pro Closed Back Kneeskin. This latest advancement in racing swimsuit technology. Plus Arena will make the Powerskin Carbon Pro suit in 4 dynamic team colors. The days of boring old plain black championship swimsuits are over. Arena Powerskin Carbon Pro suits are the first racing suit integrating a carbon cage to deliver Intelligent muscle compression, combined with unprecedented fit. Compression in a competition swim suit is associated with increased support, efficiency and power, but high compression can have a restricting effect on movement. The swimmer in motion is also a dynamic form with complex requirements for support and compression. How can you get more of the benefits of compression, without its drawbacks? Squeezing the swimmer harder will not help! To deliver a breakthrough solution to the compression challenge, arena has incorporated carbon fibre into the weave of the Arena POWERSKIN Carbon Pro fabric. Known for its unique structural and mechanical properties, the carbon fibre locks down when and where a critical stretch level is reached, while retaining the suit’s elasticity. This delivers a ramp-up in compression on those specific overextended zones, increasing support and control where and when they are needed without detracting from the swimmer’s mobility. Don’t forget to order your Arena Carbon Pro championship swimsuit today and receive a free pair of Arena Cobra Racing goggles. D&J Sports Swim Shop will be one of the select few dealers to carry this exclusive new racing suit.